When reaching a certain age, women start to think about the appropriateness of a certain apparel, as well as start to form an individual and matchless personal style, which encompasses the best and the most well-suiting pieces. Thus, at this period it’s important to have a good understanding of a personal style and just to be confident. Below, we bring some stylish wardrobe essentials for women of 40, in case you still don’t know how to dress fashionably! So this is the very period, when women tend to prefer the classic style more. This gives them an opportunity to come up with a typical and spectacularly cute style, which also involves huge proportions of femininity and charm. Hence ‘elegant’ is the key word of the style of women of 40. While young girls may use the opportunity to look messy and worriless sometimes, older women need to be on the side of conservative chic. Being more particular in terms of defining this style, we note the specific style of Chanel as a key conglomeration of ideology. And in order to add some specific flare to the looks, you may also use the details of vintage, retro, and Provence (Check out: How to Dress In the Provence Style), as well as you may also opt for the elements of romantic and all-feminine styles. When saying classic, we don’t necessarily mean the opposite of alluring and totally puritan! This is about dresses, which do flatter the figure, but also cover the provocatively open parts. Design options like cuts on the back may be used in case of the evening apparels. Floor length options are also recommended for such looks. As for business and work looks, you may always opt for the unfailing body-con mini dresses, cut on the level of the knee. Accessories are what you should pay an utmost attention to. Think about choosing belts, putting accents on the waist, more sumptuous and luxury jewelry, and other tiny details that might complete the overall impression. Cheap-looking and too casual variants should be excluded from the choices. Talking about the overall shapes, we may also note that if we speak about the garments, pieces like dresses and combos including skirts should be more frequently opted for instead of going for pants and tops all the time. Trying to be maximum classy, you may also add some interest and intrigue to your looks. Thus, forms like pleated skirts and tube options are iconic representations of the classic style. Another peculiarity of the wardrobe of women of 40 is the array of outerwear garments, namely jackets, suits, and various forms of coats, which also need to suit the figure and the combos ideally. In case of picking the jackets correctly, so that they would nicely accentuate the figure instead of showing the imperfections, being more particular we may recommend coats with the hourglass forms as the ones, which hide the imperfections and accentuate the parts that need to be accentuated. Coming to pieces like shirts, tops, and sweatshirts, we should also note that they also need to be reserved, yet stylish. Unlike all the other types of garments, in case of which you had to stick to the classiest forms, here you may experiment with the trendy vibes. In the long run, you just need to think over your looks correctly. 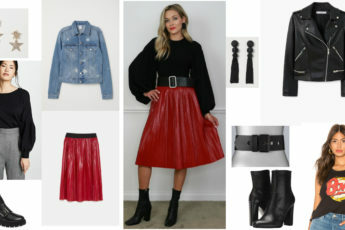 You should by no means dress up in a boring and common style, but still, the creation of unique combos with classic pieces is quite attention-requiring. And to have the most effective results, you may, for instance, match classic pants with effective and creatively pleated top, or make a certain design detail the center of the composition. And to conclude, we may just come to the previously stated idea that during this period a woman acquires her individual style and principles forming her personality stating looks. Thus, if you are one of them, then you should enjoy the opportunity to look timelessly chic and beautiful with the correctly picked and organized looks and garments, and we do hope this article has been useful for your inspiration!